Ships from United States. Most customers receive within 2-10 days. Catch up to speed with modern devices with this PCI-Express 2.0 to USB 3.0 and SATA III Combo Card (up to 6Gbps = 550mbps transfer speeds). Has both Etron EJ168A and ASMedia ASM1061 chipset. 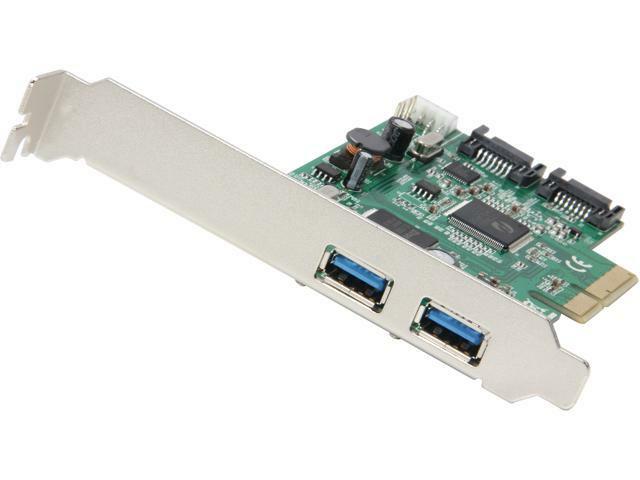 Designed with 2 USB 3.0 Ports and 2 internal SATA III ports in one PCI-Express card with a Unique HDD activity LED indicator circuit design! Unique Hard Drive Activity LED Indicator Circuit Design: The LED Blinks When There is Read/Write Activity on Any One of the Hard Drives Connected to the Motherboard or to This Add-on Card. *Notes: Card is bootable but it requires a re-install of the OS/repair of OS; does not need floppy power feed for SATA ports to function. This item is covered by OutletPC.com Return Policy. Pros: The expansion card PCIe bus width is really only x2 width (not x4 width as the NewEgg advertisement leads one to believe). The box, and printed directions within the box, indicate content include optional cables, which were not included. Listed contents should actually be "contents" in the box. The optional cables should be indicated other than under the listed "contents" as a possible additional purchase (not as contents). If the box indicates that it contains the optional cables, the cables should be included. Cons: Be clearer on the description for the advertisement and also be printed clearer on the box. Lacks the appropriate cable that is required for power for use in an Apple Mac Pro tower. See "other" below for fix. If this care is used in a Mac Pro Tower for faster SATA III (6 Gbps) negotiated link, the Mac will recognize and boot, however, the Mac OS will indicate the internal drive(s) are actually external with a yeloow drive icon. This may be confusing as to which drive is which if other REAL external drives are also plugged into the Mac. Other Thoughts: If this card is being installing in a Mac Pro Tower, be prepared to do some creative re-wiring to get power to the card. The expansion card requires power for full functionality and the card's power plug is the old 3.5" diskette drive type. Since Apple doesn't give extra pigtails from the PSU, power has to be pulled off 1 of the 4 HDD bays direct SATA connections. Took some time to get the power pin assignments wired from a non-typical male SATA power plug end to an old 3.5" diskette drive power plug. This power adapter wire should be one of those optional contents of the purchase. Pros: Nice looking well made card with all the ports, as advertised. It probably would work great, if it fit my machine. Cons: It was advertised as an PCI-Express x2 card. The user manual said it would fit in a PCI-Express 1.0 / 2.0 slot. At this time PCI-Express slots only come in 1, 4, 8, & 16. The card I received is made for ( and the picture is of) an Express 4 slot, and I don't have one on this machine. Other Thoughts: I would suggest that you buy this card only if you have a PCI-Express 4 slot empty on your machine. We are sorry you had this experience with this card. There are motherboards that have PCIe x1 slots with the back cut out so you can fit larger cards in them. However, to get full speeds you should use a PCIe x4 slot. Pros: Setup was easy my system saw it on first boot.I am mainly using it for a couple extra Sata ports since my new Z370 only has six Sata ports onboard with no secondary controller so I needed an extra port for my DVD drive not that it gets used much but you never know when your going to need it. The USB 3 ports are just a bonus but they will get used too. SYBA has all the most recent drivers on their website now, no going to the chip vendors site to get the latest USB drivers. Cons: Didn't set itself up or make me coffee. It could have come with a floppy power adapter to Sata/molex but for the price I am not shocked it didn't have it. I am running windoes 10 and am booting from my SSD drive on the card. Other Thoughts: So now my PC is lighting fast. just takes seconds to boot and you get into widows 10 from the login almost instantly !! Just this and a cheep PNY 240 Gig SSD and now one of the fastest systems i have used. The SSD made a difference although not what i had expected. after some research Ii found that my motherboard only had STAT2 ports and as i was lacking USB3 to transfer files faster and only had one free X16 slot I got this board. I did not want to run SATA 3 or mutpul USB3 ports over a X1 port. Pros: Works on Windows 10, in my PCIe2X16 slot, with Samsung EVO 850 as my bootable drive. My speeds were 285/273, now they are 405/376. That's a decent improvement for a x4 card that uses only 2 lanes. (Motherboard is Pegatron Truckee with X58 + ICH10R chipset). Good bang for the buck. Cons: - Spent half a day trying to solve the INACCESSIBLE_BOOT_DEVICE error. Tried re-imaging the System from System Image backup, tried fixing MBR, BCD, bootsector, etc. (Not sure if it had any effect, probably none). Then connected the drive back into my Sata 2 port, and installed the SYBA drivers from drivers-download website as SYBA suggests in the manual, connected the drive back to the card and it booted!!! When I first connected the card, window installed some old generic SATA drivers from 2006. - Boot times are like 5 seconds slower because the PCIe card needs to initialize (but afterward you really see the different in speed). Other Thoughts: - Haven't the USB, since I don't have the floppy power cable. Update: put in the Sata to Floppy adapter and tried out the USB. On one brand of USB drive I got 80/75 speed, on another I got 40/35 (USB 2speed), then installed the software that was on that drive and I got 105/105! So the speed is good, but I've noticed that I getting KERNEL_DATA_INPAGE_ERROR if the PC goes to sleep on its own. Update: KERNEL_DATA_INPAGE_ERROR(Sometimes from KBDCLASS.SYS), CRITICAL_PROCESS_DIED (sometimes from VOLMGRX.SYS, CDROM.SYS) , DRIVER_POWER_STATE_ERROR persist even with the newest drivers directly from Asmedia (driver version 3.1.9.0). There's some driver incompatibility and it has to do with the sleep stages and power. Disabling the S3 sleep, and leaving just the S1, solves the issues, but then it uses more power and the fans are always running. The S3 works most of the time, and it seems to work better if I put the PC to sleep as opposed to the system doing it automatically. In fact, I have disabled sleep on the computer and created a Windows Task to put the PC to sleep-- for some reason it works best but not 100%. Really weird PC gremlins. Another Update: Using hibernation instead of sleep resolves all errors. Really strange, as hibernation is usually frowned upon, but it seems to work flawlessly. So type "powercfg -h on" in the command prompt and you're done. Cons: Gave POST error when initializing on the PCIe Bus..."Unitialized ROM on Devicexxx on Bus yy" Tried in x4 and x16 slot. Caused the motherboard SATA II controller to lose attached disk drives. Could not find a cable to connect PSU to the card for USB power supplement (required for bus powered 3.0 devices). It could be hooked up to the newer (smaller) floppy drive power supplies but they will not reach the PCIe Bus and extensions are not available. Most SATA Power to 4 pin cables only connect to the older 4 pin floppy power connector. SYba does not even sell one now. It seemed like a good card if it had only worked with my PC. Might be OK on another PC. Pros: full 6gbps for each of the SATA6 ports plus bandwidth left over for the USB 3.0 (based on a PCIE 2.0 @4x. Cons: Drivers for windows 10 are best without the driver disk (use the drivers windows provides) but I say one of my two SSDs had issues when I first moved it over to this new controller (issues worked out when I changed SATA cables and reverted the driver to stock). My main complaint is every other boot I lose all connectivity with the controller and I will not notice until I am in windows. I'm sure this has to do with windows 10 fast boot (its basically hibernate), but why would it do this?? Other Thoughts: No real additional thoughts but if the reboot issue was fixed this would be a really awesome controller for the price. We're sorry to hear that you are having issues with this controller card. Using the generic Microsoft Standard AHCI drivers as you have done is our recommended option to achieve the full speeds of the card, however it seems to have caused a reboot issue in your case. Please contact our support team to assist you further by emailing support@sybausa.com. Our technical support team is available to help 9am-5pm M-F. Feel free to contact us during those business hours. Thank you for purchasing one of our products, and for leaving us your valuable feedback.